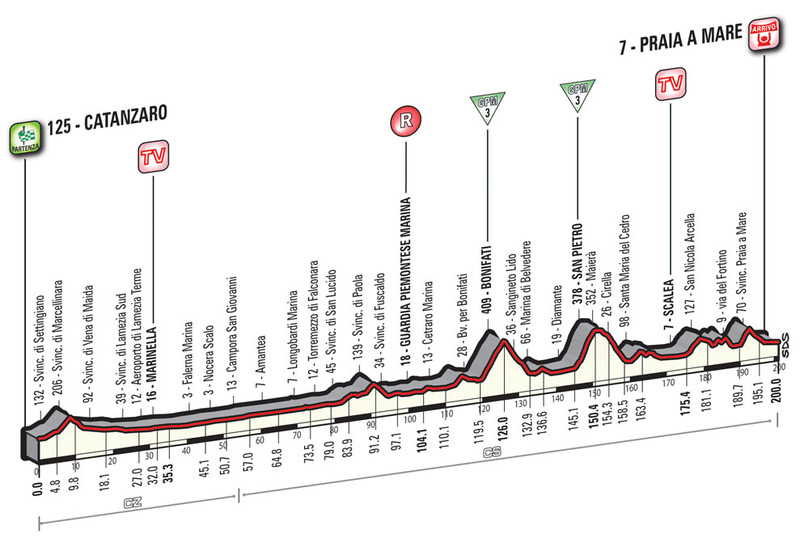 The 2016 Giro d’Italia’s first foray into Italian territory takes the form of a 200km trip from Catanzaro to Praia a Mare, poised to be a hectic finale. The second half of this race looks set to shatter the ambitions of the pure sprinters, though many of the more versatile strongmen could mount a convincing challenge and take the win here instead. For many, the major challenge to overcome are the ascents of Bonifati, San Pietro and Via del Fortino late on in the race; the last of which includes ramps hovering around 18%. Giacomo Nizzolo has been one of the strongest climbers amongst the quick-men in recent years and is likely to fancy his chances of taking his first ever grand tour stage win at 2016’s Giro d’Italia. His recent showings demonstrated a greater turn of speed than we have previously seen from him in the sprints when beating the likes of Mark Cavendish in Croatia, making him the likely favourite in a reduced sprint which lacks the powerhouse that is Marcel Kittel. Sonny Colbrelli enjoyed a relatively successful Spring campaign which showed his return to strength after a 2015 season hampered by poor health. Colbrelli seems to flourish in the face of an attritional race, and with so many late climbs to test the legs, it is easy to see him turning in a good showing here. A strong tempo which drops his faster rivals will do him huge favours on Stage 4, leaving him the fastest man left in a sprint. Matteo Trentin is the perfect alternative for Etixx-Quick Step to secure glory despite their expected loss of the maglia rosa, as Marcel Kittel is not anticipated to stay in touch over the final decisive climbs. Trentin has form for winning on these tricky intermediate stages, possessing similarly styled staged wins at Tour du Romandie and Le Tour de France for example. He is a dangerous man amongst any elite group and will need serious marshalling to reduce his odds of winning here. Luka Mezgec is an interesting watch for Stage 4, the Slovenian rider has great form for winning from a reduced sprint, though may lack the support today. Mezgec has recently moved to Orica-GreenEDGE and potentially misses the team commitment required to really dominate on a day such as this. Depending on the condition of teammate Caleb Ewan, Mezgec may find his efforts somewhat hamstrung here unfortunately. Kristian Sbaragli and Arnaud Démare are two riders who often lack the ability to string together a convincing run of form in order to contest a day such as this, but if today does prove to be an on form stage of the Giro, then they are a danger to anyone’s ambitions after surviving the late ascents. In regards to a late breakaway move lasting all the way to the line as a result of a poorly organised chase, Gianluca Brambilla will be a threat along with Tim Wellens, while a wildcard sprinter worth remembering is Movistar’s José Joaquín Rojas. Posted on May 9, 2016 May 10, 2016 by Spokenforks	This entry was posted in Giro d'Italia 2016, News and tagged Arnaud Démare, Etixx-Quick Step, Giacomo Nizzolo, Gianluca Brambilla, Giro d'Italia Preview 2016, José Joaquin Rojas, Kristian Sbaragli, Lampre-Merida, Lotto-Soudal, Luka Mezgec, Marcel Kittel, Matteo Trentin, Orica-Greenedge, Sonny Colbrelli, Stage 2, Team Sky, Tim Wellens, Trek Factory Racing. Bookmark the permalink.